I didn’t take a lot of pictures when I was in Vancouver because it was such a busy weekend, but here they are. 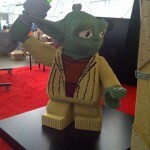 I had a chance to walk around a little bit while the show was setting up and got a good look at the Lego display. I love Lego as much as the next guy, but I almost always miss these because the show floor gets so crowded. It makes stuff like this hard to get to and harder to stand around, before getting pushed along with the traffic. Pretty neat though. 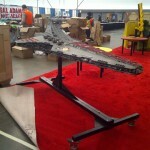 The Hulk and Star Wars Lego figures and ships made entirely of Lego. Just to give you a sense of scale, I’m about as tall as the hulk’s pecs were. Not a big turn out for costumes, at least not where I was sitting but the Star Wars guy with the Mickey Mouse ears cracked me up (I’m sure there’s a name for him that I don’t know but personally, I like “Darth Mickey”). 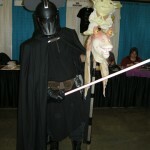 I don’t know if it was the ears or the Jar Jar head on a stick, but definitely worth remembering. The last one is a sketch my friend Jer did while I was on a bio-break and he was watching my table for me. I guess I’m mostly including it out of sentiment, but I do get a kick our of seeing other people’s take on my characters (there are more up on the Fan Art page, if you’re interested).